A double chin is caused by a subcutaneous layer (fatty tissue) sitting around and under your neck. They arise from hereditary reasons – some families store more fat under the chin – as well as from natural ageing as the skin around the neck sags. Some clients are not 100% happy with how their chin and jaw-line looks from certain angles and consciously stretch this area for photographs. A double chin can sometimes mask a jawline, giving the individual the appearance of carrying extra weight when they do not. Exercise is always recommended for general health and well-being. However, in the cause of a double chin it can only be slightly improved with weight loss. The reason for this is because we are never able to remove fat cells which have been formed. They are simply like buckets which fill or empty themselves of fat from our diet, so even when exercise the fat bucket may be empty but will always be present. This stubborn fatty layer under the chin can still be present in people who have had significant weight reduction. This is why many people seek options to permanently remove this fatty layer for a more defined neck and jaw-line. A double chin reduction can be achieved using non-invasive cosmetic injectables to permanently remove the fat cells around the chin and neck. Previously surgery was the only option to reduce a double chin, however, this procedure involved general anaesthetics and a surgical procedure which possessed health risks as well as recovery time – not to mention costs. Now with double chin injections which breaks down fat under the chin and neck area, we are able to perform double chin reduction with minimal down-time and permanent results. The treatment has been available globally for several years now used by leading Plastic Surgeons with fantastic success and has recently been launched in Australia by the world class pharmaceutical company Allergan (leading brand of wrinkle relaxing medication and dermal fillers). The prescribed medication is injected into the target problem area, the submental fat layer, which is the fatty deposit under the chin. This causes the fat cells break down, the body then naturally eliminates the fat as a waste product from the body through its metabolic processes over time. As this is a minimally invasive procedure, several treatments will be needed spaced approximately 6-8 weeks apart with minimal downtown. The frequency and number of treatments also allows for a very natural reduction of the fat layer. As with any medical procedure, you will be thoroughly assessed by our qualified aesthetic injectors for suitability for this treatment. Ice is then applied to the area before and after treatment to increase comfort levels. After the treatment swelling is expected which may take several days to totally subside. The fat cells are then broken down and reabsorbed over the 6-8 week period when the treatment is then repeated. Two or more treatments are required for best results. All clients require a minimum of 2 treatments, with larger or fattier areas sometimes requiring 4-6 treatments. With a thorough assessment you will be given a realistic quote for your area of concern and what aesthetic you would like to achieve – some want a full treatment whereas others want a subtle reduction. Ohana Cosmetic Medicine offers affordable treatment packages to achieve the best result for you. After the treatment we want to see significant swelling which can be reduced with the application of cold compresses. This swelling is a good sign that the treatment is working. Clients find that the swelling can be obvious with the first treatment as there is the highest amount of fatty tissue initially. As the area reduces in fatty tissues with subsequent treatments so does the swelling. You may take non-steroidal anti-inflammatories (paracetamol) for discomfort if needed. Once the swelling has subsided general soreness may be persistent for a few more days, typically only when the area is touched. As with any injection, bruising and redness is a possibility. Most people find that after 7 days there is minimal evidence that any treatment has been performed with any swelling/bruising disappearing. Most clients co-ordinate their treatment at the end of the week to recover over the weekend. Not everyone is a candidate for double chin reduction injections. We recommend arranging an appointment with a medical professional to assess whether you are a candidate. There are some medical contraindications as well as aesthetic expectations that may determine whether someone is suitable. If we feel that the area is financially not worth treating to give you your desired outcome we will advise so. 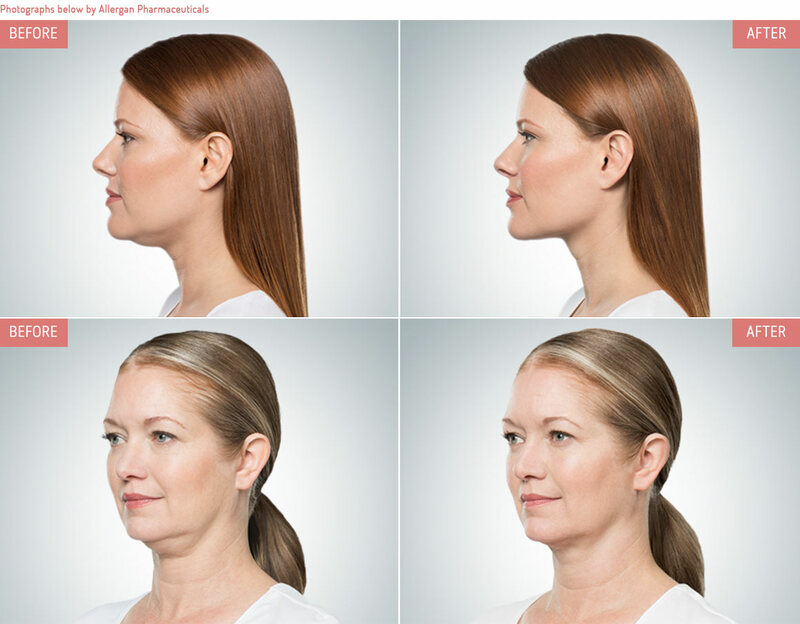 To start your journey to a defined chin, neck and jaw-line please contact Ohana Cosmetic Medicine for a complimentary and obligation free consultation with one of our medical staff. What is the cost for double chin reduction treatments?